The thyroid gland is located in front of the neck, just below your "Adam's apple" or larynx. Its main function is to take iodine, found in many foods, and convert it into thyroid hormones known as thyroxine (T4) and triiodothyronine (T3). This small gland can enormously affect your entire system because every cell in the body depends upon thyroid hormones for regulation of their metabolism. It plays a role in how your body creates energy, regulate your sleep and can be the reason behind your unexplained weight gain or weight loss. In connection with the above-mentioned role of the thyroid gland, you really have to help it function more efficiently for the improvement of your overall health. Iodine deficiency is one of the major reasons for the underproduction of the thyroid hormone, according to the American Thyroid Association. Some of the iron rich-foods you should include in your diet are iodized salt, eggs, shrimp, salt fish, cheese, seaweeds, prunes, and lima beans. Studies have found that soy has high isoflavones that can harm your thyroid. It interferes with iodine entry into the thyroid gland and prevents the action of thyroid hormone in the body organs. Cutting out soy consumption can help your thyroid normalize its hormone production. Not getting an adequate amount of magnesium can lead to an underactive thyroid. Magnesium is a mineral needed in converting iodine into thyroid hormones (T4 and T3). Eat more of shrimp, raisins, bananas, broccoli, spinach, sweet corn, and avocado. 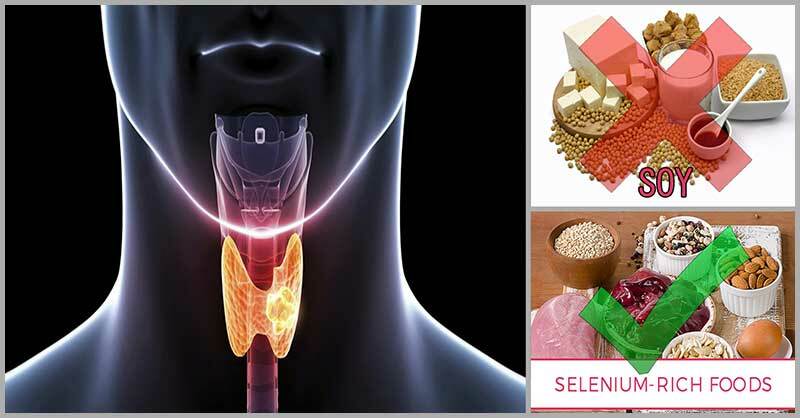 Selenium is a mineral that plays a key role in your thyroid glands ability to produce thyroid hormone. An adequate amount of selenium in your diet can help prevent thyroid problems, such as hypothyroidism and thyroid cancer. Adding selenium-rich food in your diet can help your thyroid better deal with stress, and work like a “detox”. Foods that are rich in selenium include Brazil nuts, fish, turkey, chicken, eggs, spinach, lentils, cashews, and bananas. If a body is deficient in zinc, TSH (thyroid stimulating hormones) will not be made thereby resulting in low levels of thyroid hormones T4 and T3. Aside from this, zinc is also a vital component of deiodinase, an enzyme that converts T4 into a functional T3. Foods that are rich in zinc include chicken, spinach, cashews, cooked oysters, and lean beef. Cortisol, which is created when you are stress, prevents T3 hormone from getting into your body’s cells. Due to this, it would be better if you try to avoid stressful situations. Regulate stress naturally by doing exercises like brisk walking, jogging, or biking. Warning: If you suspect a problem, you should also consult your doctor to confirm you have thyroid issues.